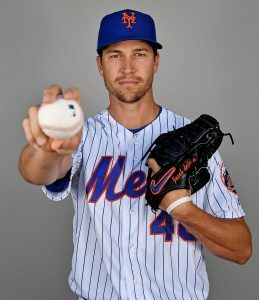 Though there are just over two weeks between now and Opening Day, Mets ace Jacob deGrom said Tuesday that he’s still “optimistic” about coming to terms on a long-term deal with the organization (link via Anthony DiComo of MLB.com). Whatever talks have transpired, both the Mets and deGrom’s camp have done a good job of keeping things under wraps, as there’s been little reported on the matter since camp opened despite deGrom’s standing as one of the game’s elite talents. The right-hander stated again today that he “definitely” wants to be a part of the Mets’ future. It’s been one month since deGrom was reported to have placed an Opening Day deadline on extension talks with the Mets. He’s slated to earn $17MM in 2019 — his second-to-last season of arbitration eligibility — and is currently on track to become a free agent after the 2020 season. On the health side, the Mets have seen encouraging progress from a few players. Jed Lowrie has resumed baseball activities and could be on track to return from his knee sprain early in the season. There’s even an “outside shot” that he’s on the active roster on Opening Day, DiComo says. And backstop Travis d’Arnaud is expected to head north with the big league club after missing almost all of 2018, DiComo adds. d’Arnaud, who avoided arbitration at a $3.515MM salary, has continued to check boxes this spring as he recovers from Tommy John surgery. Nationals outfielder Michael Taylor is turning heads inside and outside the organization, Britt Ghiroli of The Athletic writes (subscription link). While Victor Robles will be given a shot to make good on his promise, the Nats are also considering scenarios where he slides to right field to enable Taylor to roam in center. Utilizing such an alignment when there’s a lefty on the hill would also facilitate rest for Adam Eaton, who has been limited by leg ailments ever since arriving in Washington. Soon to turn 28, Taylor has had chances to seize regular time in the past but hasn’t managed to reach base consistently enough to fully realize his potential. He spent the winter working on swing mechanics and preparing to “stay strong on the mental side” with a more “positive” mindset. Taylor will enter the season fourth on the depth chart, but could still have ample opportunity with the Nats in the season to come and beyond. While the Mets seem to have largely built out their 2019 pitching staff, there’s still some potential offseason work to be done. That may not mean bringing in new arms, though, so much as looking into new deals with existing ones. There had been a general expectation that the Mets would pursue another rotation piece, whether to compete with or displace Jason Vargas in the #5 spot. General manager Brodie Van Wagenen cast doubt on that concept in an interview today with Andy Martino of SNY.tv (video link). The Mets will “still stay in touch” with free agents, says Van Wagenen, but the team presently has “no plans to sign an additional starting pitcher.” Rather, per the rookie GM, the plan is to head down to camp and evaluate from there. Whether or not Spring Training will provide opportunities — or create needs — for the Mets to consider additional hurlers, it’s expected to serve as a stage for contract talks. In particular, indications are that the club still intends to explore a new deal with star pitcher Jacob deGrom. That negotiations haven’t yet started “has left the deGrom camp, at a minimum, disappointed,” according to Joel Sherman of the New York Post. From the team’s perspective, Van Wagenen did not indicate that anything has changed. To the contrary, he says that he still “hope[s] Jacob deGrom is a lifelong Met.” There’s still ample time for talks to get started, of course — camp hasn’t opened, and deGrom is controlled for two more seasons — but it’s certainly interesting to hear that deGrom’s reps have been displeased at the lack of communication to this point. Interestingly, Sherman also reports that the Mets have designs on holding talks with Zack Wheeler, who is earning $5.975MM in 2019 before reaching free agency. Wheeler is an interesting potential extension target, as he’s fresh off of an impressive season in which he re-emerged following a three-year run of injuries and struggles. He’s younger than deGrom and closer to free agency, but hasn’t reached his rotation mate’s successes on the mound and has a much more worrisome track record. Wheeler is a difficult player to value in a hypothetical extension scenario, so it’ll be interesting to see if the sides are able to line up on a deal.